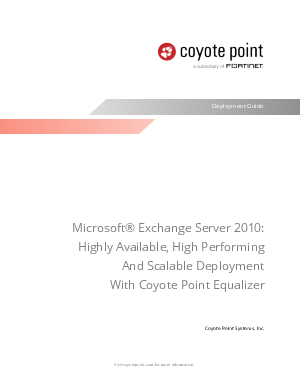 This paper explores the limitations of Windows NLB and the benefits of deploying a hardware load balancing device to achieve optimum performance of MS Exchange 2010. While software load balancers and reverse proxy solutions can be adequate for smaller deployments, larger deployments will benefit from the features and capacity provided by a hardware load balancer. Microsoft recognizes the need for load balancing client access in all but the smallest Exchange deployments. There are a number of hardware load balancing products available on the market with a wide range of features and capabilities. Equalizer differentiates itself by providing superior value; advanced acceleration features, high performance, and reliability born of over 10 years of industry experience.